Accademia del Piacere explores once again new paths in the world of historical music. 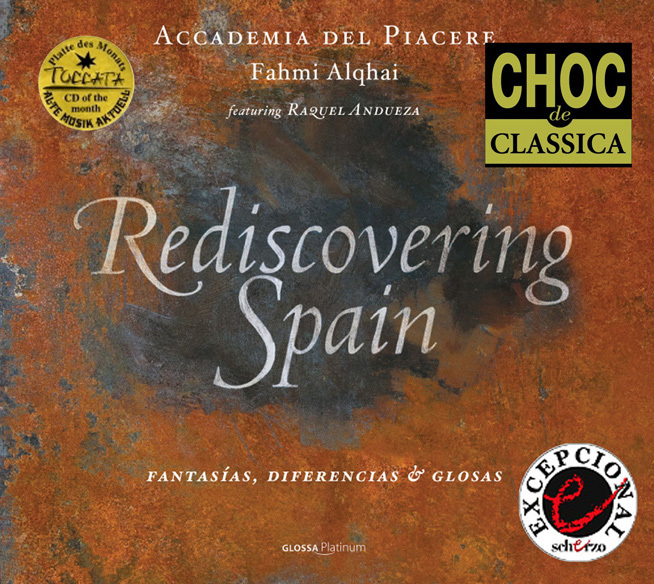 Alqhai and his Accademia revived the world of improvisation in the Spain of 1600: they follow the recommendations of musicians such as Ortiz and Ganassi, and jump to the world of improvisation, to create their own diminutions and fantasies on the masterpieces of the Renaissance and early Baroque Spain. The CD, produced and distributed in co-production by Alqhai & Alqhai and Glossa, was recorded in late 2012 and early 2013, in Sputnik studio (Seville, Spain), featuring Raquel Andueza as special guest. On sale for only € 15.00, shipping included to anywhere in the world, with notes in English, German, Spanish and French.